Interact Australia is able to assist individuals with NDIS funding, including SLES School Leavers and TAC claimants. The National Insurance Disability Scheme (NDIS) provides direct funding for individuals, plus information and connections to services in their communities. Every individual has a plan that lists their goals and funding. Individuals can use their funding to purchase supports and services to help them achieve their goals. Find out more on the NDIS website. School Leaver Employment Support (SLES) is a an NDIS support available for up to 2 years after finishing year 12, to help individuals transition into employment. Interact can tailor services to support your individual needs in preparing for or starting work. Find out more on the SLES website. The Transport Accident Commission (TAC) is a Victorian statutory scheme that provides compensation and payments for people who have sustained a personal injury in a traffic accident. Interact can support TAC clients with individualised supports that help to achieve goals and provide ongoing support to coordinate the treatment and services required. For more information visit the TAC website. Interact’s individualised supports are available to people living with a cognitive, psychological or physical disability. 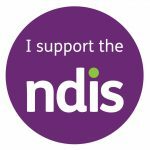 Live in an area where the NDIS is currently available – if you don’t know, visit the NDIS website or call 1800 800 110. If you are still unsure if we can assist you in finding employment, please contact us on 1300 FUTURE today.